This contribution from Mike Dubé vividly illustrates the challenges that francophones encounter in Ontario. While on the American side of the Great Lakes, the language of our forebears is all but gone, Ontario has a francophone population of around 500,000 people. Yet despite this, family dynamics, popular culture, and many other reasons may lead young people away from their heritage. Here is one story of a return to the language of youth, and a determination to pass on French and Franco-Ontarian heritage to the next generation.—ed. Image courtesy of Alan L. Brown and http://www.ontarioplaques.com. A few years ago, on a cold, grey Saturday afternoon, I joined a small group in front of the Capitol theatre for a walking tour of the city. Marcel Bénéteau, a French professor and folklorist, led us through the streets of Windsor, Ontario. Walking parallel to the Detroit River, we made frequent stops to discuss the streets named after the early francophone settlers. We learned about how these ancestors like Ouellette, Goyeau, and St-Louis were granted farm lots back in the 18th Century – long, narrow strips of land that stretched to the river bank; French street names with similar-sized lots can be found on Detroit’s East side. We all laughed at how we’ve anglicized and mispronounced these street names; I’ve referred to Pierre St. as “Pee-Ree” in casual conversation. 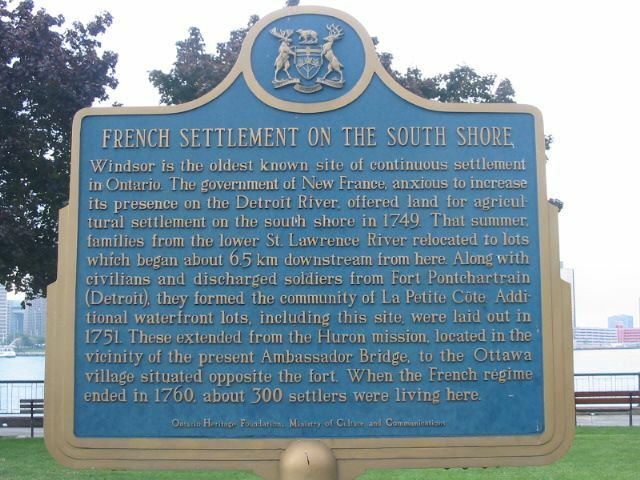 The names are reminders of Windsor’s French-Canadian heritage, yet this area is the most culturally assimilated in all of Ontario. Still, I was surprised that a few attendees with common French family names didn’t speak the language at all. I had the advantage of learning the language as an infant, in another region of Ontario. Even so, I almost lost the ability to speak it, and it’s been a constant struggle to retain it. My mom`s family came to Ontario from Quebec, and my Dad from New Brunswick. They met, married and raised my younger brother and me in Woodstock, Ontario. Growing up in an English-speaking community, several touchpoints helped me maintain ties to my cultural heritage. The smells and tastes of Grand-maman’s French-Canadian cooking, which included des galettes and des crotons, reminded me of my family`s ancestry. Christmas time was always a special time for traditional family dinners to be served; Le Réveillon included la tourtière, la paté à viande, and le ragout; Le sucre à la crème always helped to satisfy my sweet tooth. I attended a French-Catholic school, and I`d lose my francophones (fake money made of green cardboard paper) whenever I got caught speaking in English; I don’t remember collecting enough of them to win the weekly prize. Teachers would impart significant historical events through song, art, and special activities – my mom still has a newspaper clipping of me making La tire de Ste. Catherine (taffy). Sports provided another gateway to the French language. As a hockey-loving kid, it was a glorious time to be a Montreal Canadiens fan. My dad, brother, and I watched the Habs win four consecutive Stanley Cup championships on the French CBC channel; during road hockey games, we’d chant Et le But! after every goal. Le Club Cartier, the town’s community hub for euchre tournaments, launched a broomball league. My brother and I would run around the arena with our friends while my dad and uncles would be playing on the ice. But as I grew older, familiar touchpoints started to disappear: My mom’s family migrated back to Quebec, I stopped attending a French-language school, and sports took a back seat to rock and roll. Soon after, I took to speaking Le Franglais to my parents. I only began to have a renewed respect for the language in my 20’s, when I moved to Windsor to study French Language and Literature at the University. I first learned of local history around the Great Lakes from some of my professors. After earning my degree, my education helped me to gain employment, and I’ve applied it in various jobs. I married into another Franco-Canadian community with roots in Northern Ontario (my wife Michelle grew up in Rivière-aux-Canards). Every few years, we`d attend a family reunion in Lavigne, near the Franco-Ontarian capital of Sudbury. Dinners were served at the local hall, and traditional French songs sung around the campfire, accompanied by fiddles and guitars. With an infant daughter of my own, I’d like for her to reap the benefits of being bilingual, so I add traditional and modern French songs to iPod playlists, read children’s books to her in French, and insert French words and expressions in everyday activities. I’m sure Sophie will face many challenges in learning and maintaining the language, so enrolling her in a French-language school will be a necessity, as well as getting both sides of the family to speak to her en Francais. Ironically, in my desire to teach her the language, words and expressions from my own childhood have resurfaced, helping me to recover my own true voice. Just as I’ve rediscovered my own Franco-Ontarian heritage, my hope is that Sophie will one day appreciate hers as well. I look forward to the day where we can carry a conversation in French. Perhaps down by the riverfront, where we can discuss the significance of all those street names. Mike,I had all that food you mentioned and I especially remember looking forward to la tire for La Sainte Catherine. I also met someone from Windsor in Ottawa at the Teachers’ College there very long ago. I couldn’t understand why she spoke French.I hadn’t thought about the French having been all over the area in the 1600s and later.And we’re still there now! How about that! Lucky you for having married into another Franco-Canadian family. You must be sharing a lot of the same memories. Yes, my wife and I do share a lot of similar memories, Jeannine, but it’s also interesting to notice the subtle differences as well. Sometimes, there are French words and expressions with which I’m not familiar; some of the family recipes, like tourtiere, for instance, vary from region to region. Thanks for your reply, and I really enjoyed your story for this project!